For official rules visit the Women's Flat Track Derby Association website. A team consists of 14 players; 5 players, 1 jammer and 4 blockers are fielded during a jam. 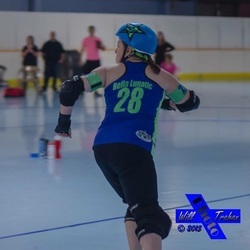 Jammer: The jammer is designated by a star on her helmet and her objective is to work her way through the pack of blockers ahead of the opposing team's jammer. The first jammer to break through the pack becomes the lead jammer. The lead jammer is the only jammer who can call off the jam. Both jammers begin scoring points on their second pass through the pack. Pivot: One of the four blockers is called the pivot. She is designated by a stripe down her helmet. 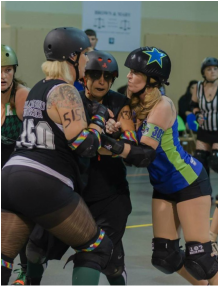 The only difference between the pivot and the other three blockers is that the jammer may "Pass the star", which is when the jammer removes her helmet cover and passes it to the pivot who puts it on making herself the jammer. Blocker: Four blockers, including the pivot, make up the majority of a fielded team. 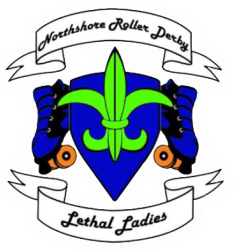 Their job is to assist their jammer through the pack while preventing the opposing team's jammer from making it through. The beginning of the Jam is signaled by one whistle blast. The two opposing jammers, who start the jam behind the jammer line, spring forward and try to maneuver their way through the pack. The first jammer to pass the last player in the pack becomes the lead jammer and races ahead to lap the pack. The lead jammer remains so until the end of the jam, the jam clock runs out which is signaled by 4 blasts on the whistle by the referee, or the lead jammer calls off the jam by motioning toward her hips with her hands in an up and down motion. Once the jammers catch up to the pack again, they work their way through the pack again gaining 1 point for every opposing player passed. What's He Doin' With His Hands? That funny man in the striped shirt is one of our dedicated Derby Officials. There are a lot of skating officials darting about the track both on and off skates, but the one's you will see the most are the referees. There will generally be one Head Referee, two Jammer Referees (one for each team) and the rest, if there are more than three, are designated Pack Referees. Jammer Referees will have an armband coordinating for the Jammer they are assigned to. The referees observe the players looking for Penalties. A more complete description of the officials can be found HERE. Called when a player blocks another player above the collar. Called when a player blocks another player using their hand or forearms. Called when a player blocks another player below mid thigh. That includes deliberate falling or sprawling in front of a player. Called when a player blocks another player using their elbow. Called when a player blocks anther player directly in the back anywhere on the body. 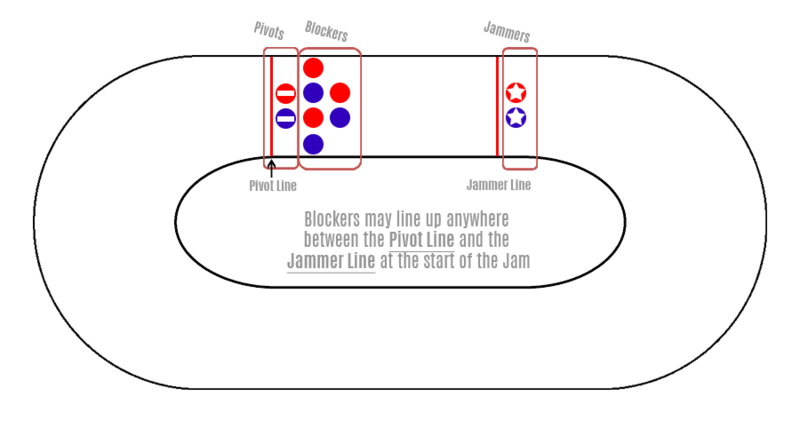 This indicates that no pack is present on the track and the blockers, which make up a pack need to tighten up or penalty whistles will start blowing. This is what you want to see for your team's jammer. It means that they are designated lead jammer. This indicates the bounds of the Pack. Blockers may not engage the Jammer outside the pack. 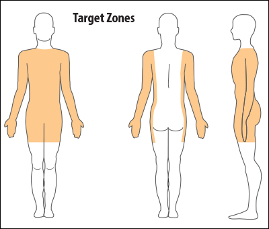 If blockers do not return to the designated pack after this signal is thrown they will be penalized. When a player gets knocked out of bounds by a legal block, they must return in-bounds at a point on the track behind the initiator of the block. 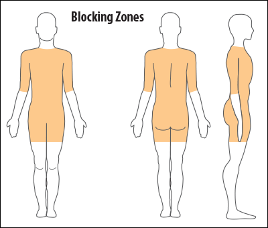 Exceptions to the rule are if the initiator of the block falls down after the block or steps out of bounds after the block.